Today’s plant is another one that has produced seedlings that are growing in our lab. 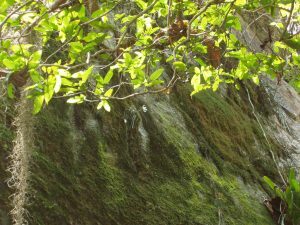 Leptotes bicolor is native to Brazil and we have observed it growing on a shady moss covered granite rock face in dryish forest at 900m altitude. We cultivate it in our Warm Americas section (minimum 150C) and mounted on bark where it is watered every day. 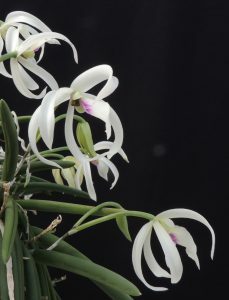 The plant of Leptotes bicolor in our top photograph has been in the school greenhouse since 1994 as a seedling mounted on the small piece of cork bark it still clings to. 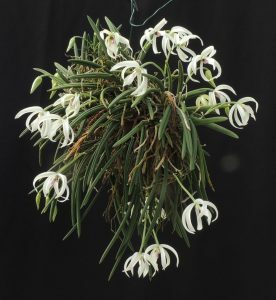 It has steadily grown into a stunning ball of small terete leaves and masses of white and pink flowers. It won a Certificate of Cultural Commendation from the RHS Orchid Committee last year.